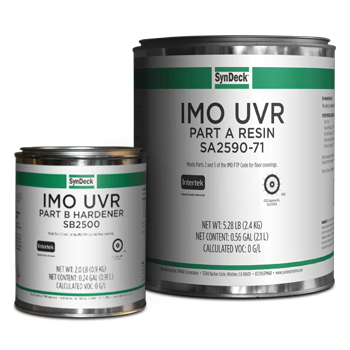 SynDeck® IMO UVR SS2590-71 is a high performance, UV resistant IMO epoxy top coat with a very resilient, high gloss finish. This user-friendly marine coating has excellent adhesion and is also highly abrasion resistant. It is 0 VOC, self-leveling and has very low odor. This product can be applied at lower temperatures with no blushing. SynDeck IMO UVR UV resistant epoxy has a superior clarity and it dries for foot traffic overnight. It can also be used as a part of SynDeck’s Anti-Slip systems.